Sierra On-Line, popular publishers of text and graphics adventure games for the ST, have released Manhunter: New York, a 3-D animated adventure set in the glorious "Big Apple." 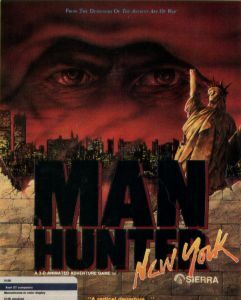 Manhunter has over 250 different scenes, including accurate maps of New York City, and features split screens, windows, close-ups and a new data storage technique that allows more screens per disk. According to Sierra, "Manhunter is cut from the same mold as Stephen King novels, combining horror and humor…when playing Manhunter there is more than meets the eye." "Manhunter takes place in the 'Big Apple' two years after an alien invasion and subsequent world takeover. You will have a chance to play a deadly arcade game in a Flatbush bar, visit a spooky Coney Island carnival and fight off a menacing band of street thugs. Forced into this post-apocalyptic world you must wear the designated brown robe and avoid speaking to other humans, the penalty being death!" Manhunter is a huge game, coming on five 3.5-inch disks, and is available now.